Happy New Year guys! ESQ launch was amazing, thanks for so much love! We hope you are enjoying your new deeeep beats station. This device closed the OOG series: we’ll improve existing tools (and free updates, bringing new features, are coming! ), but the series is now complete (in Max For Live domain at least). Not usual here at K-Devices, I’d like to share some plans we have for this year, cause what’s coming is really exciting, and I need to start talking about it, eh eh. 2019 will see coming something really new for us: we’ll take a long drive out of maxforliveLand… to release our first VST/AU/AAX (and new AUv3) plugins! Let’s start with this. To bring new incredible tools into your music composition workflow, assuring an high quality standard, we teamed up with Nick Thompson, owner of Creative Intent. The guy is just great, and we are already planning a lot of projects together! We have new Max For Live devices coming! We are developing new devices focusing (again) on that spot that makes relationship between Ableton Live and Max For Live so unique. We want to improve your experience with our products, providing new contents. We recently started a series of tutorials here on the blog, with articles about MOOR, and TATAT. The quick video #kfeatures series, on Instagram / Twitter / Facebook, will show the potential of our tools, parameter by parameter! 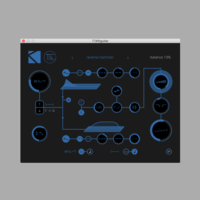 Last, and this is so cool, we are interviewing bands and composers using K-Devices fuel. We’ll talk music, and technology, and a lot of interesting stuff. We started with a duo we really, really love: Second Woman!! Interview will be online in few days. This will be a really exciting year at K-Devices: just be sure to follow us on social networks, or subscribe to our newsletter. A great year, full of good music, to all of you!